A6570 (Ever Ready No. 126 replacement) 4.5V 'Box Battery' (A6570, Hercules HS6570G, 3LR12, 3LR20, 126) 4.5V Box Battery. Length: 101 mm. Height: 89 mm (79 mm excl knurl) Width: 34 mm. Contacts: two brass knurl nuts. Price: £15.49 each. (£14.99 if you buy two or more). Postage and packing included. An excellent replacement for: Ever Ready No. 126, Ever Ready Number 126, Ever Ready Type 126, Drydex H30, Eveready No. 126, G.E.C BA6110, Oldham K766, Siemens B6, Siemens 426, Vidor V0008. This Hercules HS6570 (A6570, 3L90, 3LR20, 126) 4.5 Volt battery block is commonly used in the telephone industry. The Hercules HS6570 (A6570, 3L90, 3LR20, 126) 4.5 Volt battery is an excellent replacement for the Energizer Number 126 battery that is often found powering electric door-bells. The dimensions of the original Energizer Number 126 battery is 99 mm x 87 mm (78 mm excl knurl) x 34 mm - so you can see that the Hercules HS6570 is almost an exact fit, just a millimetre or so larger in some directions. 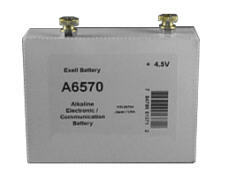 Remember this Hercules HS6570 (A6570, 3L90, 3LR20, 126) replacement battery is alkaline. The originals were Carbon Zinc (or sometimes heavy-duty Zinc Chloride) chemistry. Our alkaline chemistry is a significant improvement on the originals and makes it an ideal long-lasting battery for alarms, door-bells, flash-lights and torches.